Bacon, onions, and bell pepper help to flavor this tasty hot potato salad. The bacon drippings provide the flavorful fat for the dressing. 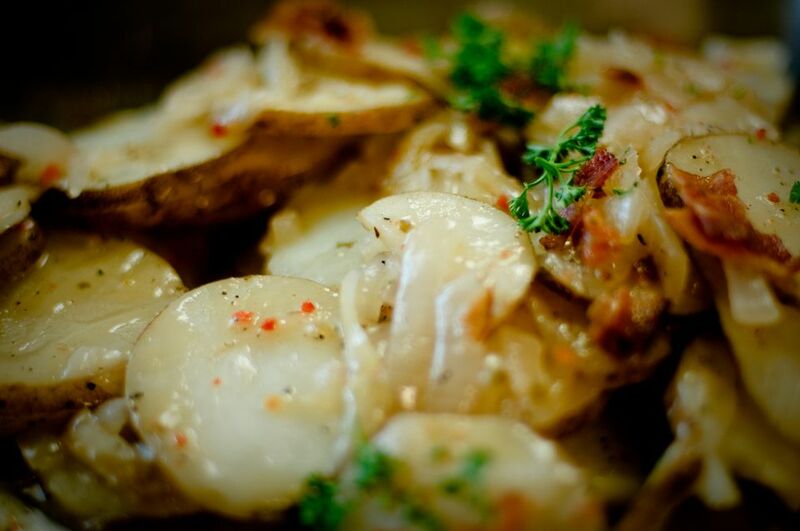 Waxy potatoes are the best choice for potato salad because they tend to hold up well when boiled and used in salads. Round red and round white potatoes are excellent or choose Yukon gold, long whites (not baking potatoes), or new potatoes. Peel the potatoes and rinse in cold water. If the potatoes are quite large, cut them in half. Place the potatoes in a large saucepan. Cover the potatoes with water and bring to a boil over high heat. Reduce the heat to medium-low, cover the pan, and continue cooking for about 20 to 25 minutes, or until the potatoes are tender. Slice the potatoes thinly or cut into small cubes. In a large skillet, fry bacon along with the onions and green bell pepper until browned; add the vinegar, water, salt, and pepper. Add the potatoes to the bacon mixture; cover and simmer over lowest heat for 5 to 10 minutes. Make-Ahead Tip: Early in the day or the day before, cook the potatoes, slice or cube, and refrigerate in a covered container. Cook the bacon, onions, bell pepper; add the vinegar, water, salt, and pepper. Transfer to a container; cover and refrigerate until 10 minutes before serving time. Put the bacon mixture in a skillet or saucepan and bring to a simmer. Add the potatoes. Cover and simmer for about 10 minutes. For a thicker sauce, blend 1 scant tablespoon of all-purpose flour into the cooked bacon, onion, and bell pepper mixture; cook, stirring, for 1 minute. Add the vinegar, water, salt, and pepper; continue with the recipe. Add 1 tablespoon of sugar to the sauce, or to taste. Add 1/4 to 1/2 teaspoon of celery seed to the sauce. Use red bell peppers or a combination of red and green. Use uncured bacon or replace the bacon with turkey bacon.